Busy Mommy? Tired Mommy? Come Pamper Yourself While Your Kids Also Have Fun! Are you a busy mom and your life seems all about werk!werk! werk! werk! werk! werk! Do you feel like you give of yourself to your child, spouse, work & even other people without even giving yourself anything in return no matter how small? 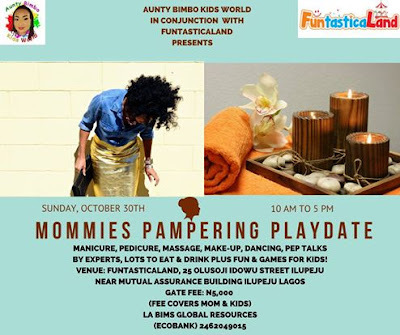 Why not come live a little, let down your hair and get your groove on as Aunty Bimbo Kids World in conjunction with Funtasticaland presents a Mommies Pampering PlayDate on Sunday October 30th 2016. Come hangout with other Mommies like yourself and allow someone else pamper you for a change NO HOLDS BARRED STYLE!!! You also have a chance to bring out your inner child with the activities lined up all for your PLEASURE and EXCITEMENT! 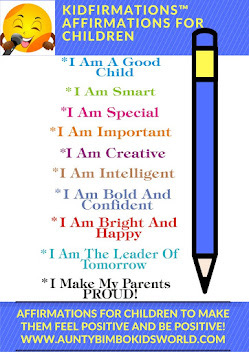 Best of all, your kids are not left out as they also have access to the following with Child Minders available in the awesome controlled & secure environment of Funtasticaland! 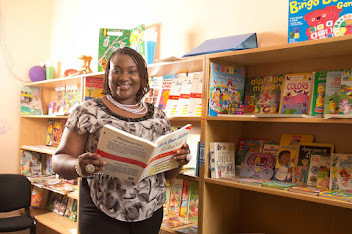 All these and more at a HIGHLY SUBSIDISED rate of N5,000 (five thousand naira only). Please note you need to pay before the event to secure your spots or it reverts to N7,500( seven thousand five hundred Naira) on that day! Its definitely a MOMMIES AFFAIR! WHOOP! WHOOP!